The race is divided into 2 parts from a gps tracking perspective, this to separate the different GPS tracks and to establish a quality assured way in calculating distance and elevation. From a runner perspective, as well as race management perspective, the race is performed continiously and considered as one single race. Meaning that the athlete starts at Norrviken/Båstad and performs the race in sequence. No external support along the track is allowed. At 4 positions along the track the runner will have access to "drop bag” (at the major drink/food stations) which is packed and marked before the start of the race. The full distance has been GPS’d by foot carrying two GPS units set up according ITRA recommendations. 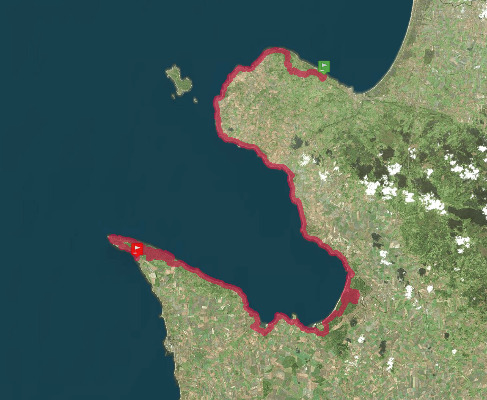 The first part (NORRVIKEN-MÖLLE-FINAL.gpx) of the race is 95,9km with an elevation of 1352m. This part has 2 drink/food stations and 3 refreshment posts. During this initial part the athlete will navigate using a map supported by race markings at difficult passages. The second part (ULTRA Loop x3 FINAL.gpx) is 3 laps where each lap is 21,2km with an elevation of 923m/lap and each lap has 2 drink/food stations and 1 refreshment post. This 3 lap loop is marked by the race organisation to ensure compliance.